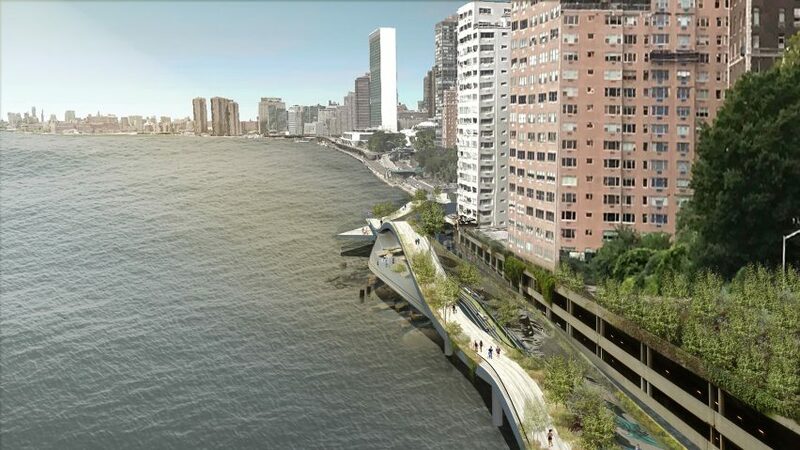 US architecture firm wHY has developed a proposal for oscillating bicycle and pedestrian pathways along the Manhattan side of the East River. wHY's landscape and urban design arm Grounds developed the scheme in response to a request for proposal from non-profit organisation New York City Economic Development Corporation, as part of a wider mission to connect the city's 32 miles of coastline. This particular call asked entrants to find ways to link pedestrian and cycle routes along the Franklin D Roosevelt Drive, between 53rd and 61st Streets. This section runs parallel to Roosevelt Island, a narrow strip of land between Upper Manhattan and Long Island City, with views to the Cornell Tech Campus, Four Freedoms Park and the Queensborough Bridge. Taking cues from Japanese zig-zag bridges, which are shaped to face different views, wHY's East Midtown Greenway would oscillate up and down so that the peaks would provide vistas to the different features across the water. The greenway would be separated into a route for cyclists and runners, and another for pedestrians and planting, and would undulate to different heights to suit the different modes of transport. "We need imaginative responses to public space in cities across America, and New York is no exception," said wHY Grounds director Mark Thomann. "Connecting to the bodies of water surrounding us and enhancing our relationship to the East River is critical to our reality now and our future of resilience, culture and biodiversity," he added. "It is an active space, encouraging healthy lifestyles." The greenway, which is estimated to cost $70 million (approximately £53 million), would be accessed by bridges at either end. wHY's studio intends it to host a programme of arts events – similar to the High Line Park on the other side of Manhattan – and projects that will fund its upkeep. To accommodate this, the studio has developed the slopes to provide noise buffers, and nooks located underneath the peaks to create sheltered spaces for different activities. Other features would include native and riparian planting set along the riverside to foster natural life along the walk, provide shading and offer protection from the brackish spray of the water. Grounds is one of four internal studios run by wHY, along with Ideas, Buildings and Objects. Founded by Kulapat Yantrasast in 2004, the New York- and Los Angeles-based practice has recently completed work on the Marciano Art Foundation in Los Angeles and Grand Rapids Art Museum in Michigan. Earlier this year, the firm won a competition to design a new events pavilion overlooked by Edinburgh Castle with its proposal for a series of glazed pavilions topped by wave-shaped roof gardens.